On 24 March 2011, Budapest could have celebrated the 137th anniversary of the birth of one of its most famous sons, except that few people know that the world’s greatest escapologist, Houdini was Hungarian. Harry Houdini was born Ehrich Weisz in Budapest on March 24, 1874, the third of five children born to Cecilia and her husband Rabbi Mayer Samuel Weisz. Ehrich Weisz grew up to become Harry Houdini, the greatest escape artist, illusionist, magician and self-promoter in the world. When Ehrich was four, the family emigrated to the United States and settled in Appleton, Wisonsin. His father became the Rabbi in the town and later Houdini told everyone that he was born in Appleton, hoping that the public would accept him as an American. However, family life in the new country was not very settled, the family had to move house often and Ehrich and the other children tried to help out financially. The eight-year-old Ehrich took a paper round and also shined shoes. Ehrich’s passion for magic and showmanship originated from watching the performance of a travelling magician, Dr. Lynn. In 1883, aged only nine, he first appeared on stage as ‘Ehrich, the Prince of the Air’ performing on the trapeze and also as a contortionist. Three years later, he ran away to join a travelling circus and tried to build a career as ‘Eric the Great’. When his family moved to New York, a year later, he moved back home. After his father’s death in 1892, Ehrich took a number of menial jobs; as a messenger, an electrician’s assistant and as a locksmith’s apprentice, which was to prove invaluable training for his future escapologist profession. He also was very interested in physical fitness and won awards in athletics and swimming. Aged 15, Ehrich read the autobiography by the French magician Jean-Eugene Robert-Houdin. The book changed his life. As a tribute to his hero, he called himself ‘Houdini’ with the Hungarian style adjectival ‘i’ form meaning ‘Houdin-like’, and started performing magic shows for $12 a week. In 1892, Houdini formed a double act with his brother Ferencz, who had changed his name to Theo and later performed under the name Hardeen. The Houdini Brothers first performed the ‘Metamorphosis Illusion’ at Coney Island, Houdini repeated this trick more than 11,000 times during his career. In June 1892, while working at Coney Island, in June 1894, Houdini met his future wife, Bess, a singer and dancer with the Floral Sisters. They were married two weeks later and Bess replaced Theo in the double act, which then became known as The Houdinis. The couple worked for P.T. Barnum’s museum, for circuses, at fairs and even on Native American reservations. Houdini did complicated card tricks but mainly concentrated on broadening his repertoire of extraordinary escape stunts. Houdini developed the ‘handcuff challenge’ act, offering $100 to anyone in the audience if they could produce a pair of handcuffs he couldn’t get out of, he never had to pay out. However, Houdini’s target of fame and fortune still eluded him. Houdini’s luck changed when he met the top booking agent, Martin Beck. Beck put him as headliner on the vaudeville Orpheum tour, where Houdini concentrated on escapes and illusions, with one attention-grabbing novelty act. In each city, that the Orpheum vaudeville show visited, Houdini got the police to lock him up in the city jail and then he would escape, with great publicity. His weekly wage packet immediately doubled to $125. In 1900, the Houdinis sailed to London for their first tour of Europe. Houdini grabbed the public’s attention with daredevil stunts such as escaping from handcuffs in Scotland Yard, jumping into the river Seine with handcuffs on and emerging from the waters without them. Houdini soon became a star and the highest paid entertainer in Europe. The couple returned to New York and bought a home there. Houdini was mentally, as well as physically, very strong. He devised more and more outlandish stunts and ever more ingenious methods of escaping. He escaped from padded cells, death row cells, coffins, sunken packing crates, a enormous paper bag which remained intact, a roll-top desk, burglar-proof safes, a giant football, an iron boiler, a diving suit, a mail bag, a plate glass box, and one of the most unusual, a preserved giant squid! Combining his early training in swimming and as a locksmith, Houdini astounded the public by jumping into San Francisco Bay with a 75-pound ball and chain shackled to his ankles plus handcuffs on his wrists. In New York he escaped from a weighted packing case dropped into the East River, and repeated the stunt nightly in a huge tank in a theatre in town. When he went on tour, Houdini knew how to attract attention and draw crowds to his shows. Before the evening performance, he would escape from a straight jacket while suspended by a rope from a high building above the gathering crowd. Houdini returned to London many times and there, in 1914, created the famous ‘Chinese water torture cell’ act, in which he was dangled upside down by his feet in a locked tank of water. As Houdini’s fame grew, so did his stunts. One illusion, ‘Jenny the Vanishing Elephant’ was the world’s largest and needed a special gigantic stage at the New York Hippodrome. 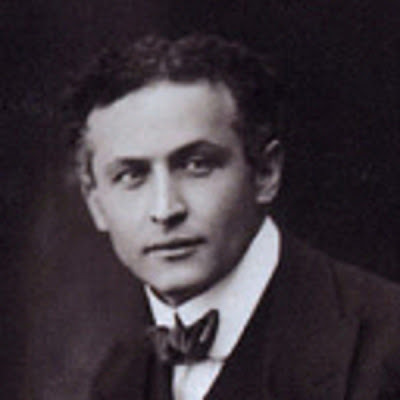 An all-round entertainer, Houdini also acted in silent thriller movies, and produced several films with himself as the lead. In 1926, Houdini began a crusade against spiritualists and mediums, whom he considered charlatans, out to swindle grieving families of their money. He testified before a congressional committee investigating spiritualists. Houdini performed a series of death-defying stunts such as swallowing needles and threat and then pulling them from his mouth and lying underwater in a sealed casket for 90 minutes, breaking the world record. However, it was ironic that his untimely death came as the result of a seemingly minor problem, appendicitis. On October 22, 1926, Houdini was preparing for a show at the Princess Theatre in Montreal when a student from McGill University asked if he was strong enough to withstand a punch in the stomach. Houdini tightened his stomach muscles and a young man hit him three times, causing his appendix to burst. At the time, Houdini didn’t realise what had happened and continued the tour, despite great pain. Nine days later, after performing at the Garrick Theatre in Detroit, Houdini collapsed and died from peritonitis aged only 52. The date was October 31 – Halloween. Despite Houdini’s distaste for spiritualism, to this day people still hold séances in an attempt to contact the great escapologist, and the first international superstar of the 20th century. I just take a peek and I discovered your post. I had a great time reading it. I find it informative as well. Thank you for sharing this such a nice blog.